MUNICH – The Man Who Said No! I found the subject matter of the book absolutely spell bounding and as a follower of WWII history, you are led into a believable world of what may have been. The characters came alive and the author has obviously been diligent in his research of those times. A most enjoyable read and one of those books that one cannot put down. TICKS ALL THE BOXES…READ THIS GEM! Munich: The Man Who Said No! Is one of the most intriguing books I have read in a long time. It ticks all the boxes! This fast paced Historical Fiction Thriller is absolutely captivating. I found it extremely hard to put this book down. It follows two different eras, the first being set in 1938 – written in first person, Bradley Wilkes, a foreign correspondent gatecrashes the pre-war Munich Conference to protest against the British Premier’s surrender to Hitler. The second being set in 2015 – written in 3rd person, Emma Drake, a history researcher, intrigued by the mysterious disappearance of her grandfather (Bradley Wilkes) is provided the opportunity to lead a conference to reassess the significance of the events in Munich. This conference allows Emma to delve further into her own investigation into her grandfathers disappearance. With unexpected twists and turns throughout the conference, there are many obstacles in the way. Extremely determined, Emma continues to find an answer to the troubling question. I recommend anyone who loves ww2 based historical fiction novel to read this gem. Munich: The Man Who Said No! by David Laws is a fascinating journey, very creative and fast paced. The book manages to weave just the right amount of history to make the fictional story seem believable and have the reader care about the characters. I enjoyed how the author jumps from one time era to the other, giving our historian a clue, just enough to pick our curiosity, and then continues to elaborate in the form of a journal from the past. This was very well done and kept me reading. When I started reading the book, about a quarter way in, I thought the author might have taken on too much. There are many characters to keep track of, at least two timelines, and several sub-plots. Somehow though they all managed to work together without interfering with one another. I thought it was great that the academic conference in the book has just as much drama, dirty tricks, and backstabbing as any other subplot mentioned. The two main characters are great, Emma is a modern bad-girl, a no nonsense academic who is not afraid to get her hand dirty. Emma’s “protector”, is a man of many “ex’s” (ex-cop, ex-con, etc.) who is also her mother’s boyfriend. The relationship starts out on the wrong foot, of course, just as any relationship with two hard-headed personalities is. During the book the two learn to rely on each other’s strengths and complement the weaknesses – in short: work as a team. Zohar, Man of laBook, bookish blog. I really enjoyed this book. Without giving away spoilers there is a subplot that runs along the main premise of the book and it is only at the end that everything makes sense! This would make a great film, if not a TV series and I really hope there will be more books featuring Emma Drake and/or Roper. Goggle eyes, wing collar and a mournful moustache. This can only be Munich 1938 where Neville Chamberlain, the great appeaser, is about to sign the agreement that will do the dirty on Czechoslovakia and give us ‘peace in our time’. Suddenly there is uproar in the room. A newcomer tries to stop him signing. This is the moment that launches David Laws’ story, a gripping and fast-moving tale that transports us from Hitler’s HQ into modern Munich and concludes in a long-forgotten theatre of World War ll. It comes out on the 80th anniversary of the signing and is largely set in the present-day city. Emma Drake, an obsessive Cambridge academic, is organising a pan-European conference of historians to shed new light on the document’s rights and wrongs. It is staged on the very site of the signing and also gives her the chance to discover what happened to her grandfather, a radio reporter who vanished on that momentous day. But some of her delegates are not what they seem and suddenly the conference develops an alarming sub-culture with frightening implications. Luckily she has help, in the shape of Gerald Roper, a journalist who considers himself unemployable after doing a three-year stretch for phone tapping. He becomes Emma’s resourceful and faithful back-up, although his boss’s nightmarish requirements stretch his loyalty to the limit. Laws’ minute research takes us deep into the curious atmosphere of a city that still has plenty to hide as this intriguing yarn builds up to an unexpected climax. As Emma’s dogged determination begins to border on the unhinged, we are on the edge of our seats as her quest reaches the moment of truth and propels her into a whole new world. Nearly 80 years ago desperate British diplomats flew to Munich in an attempt to avert the tragedy of the second world war. One man tried to say No to appeasement by confronting Neville Chamberlain with shocking evidence that could have halted the shameful “peace in our time” deal with Adolf Hitler. He failed – and no one was able to solve the mystery of his subsequent disappearance. In modern-day Munich, “bad girl” Emma Drake with a pout and a penchant for high living, discovers hidden talents as she strides into trouble intent on uncovering what happened to her grandfather, the Man who said No. Emma uses her academic intelligence and some dirty tricks as she chases Nazi ghosts around Munich, bringing back memories of Hitler in the 1930s which many Germans would like to forget. Helped by an ex-journalist with a chequered past, and a suave new-generation young German, she confronts the nightmares of the past and the present, as well as her own future. David Laws uses his intimate knowledge of the city to bring the history of Munich to life in this thrilling tale. If David Laws’s work does not make it to the cinema, I’ll want to know why. Surely, there’s enough bold imaginative action here, combined with an efficient mix of historical fact and documentary-style drama, to engage a Spielberg? Think The Spies of Warsaw, or Bridge of Spies. There are few “what if” works of fiction that have succeeded with great force but this is not one of those despite appearing so at first glance. Our hero, journalist Bradley C. Wilkes, cons his way into the 1938 four-power Munich conference of Germany, Italy, France and Britain with Hitler, Mussolini, Daladier and Neville Chamberlain. His intention, metaphorically, is to grab The Bird (Chamberlain) by the lapels and scream into his face: “Don’t be an idiot! You can’t appease a raving maniac!” He’s more polite than that; after a nervous passage past hair-trigger Nazi security to the conference he gets his chance to speak his mind directly to Chamberlain. Don’t appease; don’t ignore the warnings of sources inside Germany that spelt out Hitler’s war plans. What could possibly go wrong? Just about everything. For a start, Wilkes’s colleague Jarek pulls a gun on Hitler, then moves to take aim at Chamberlain. Laws moves the action from Germany’s war years to Cambridge University 2015, with Wilkes’s granddaughter Emma Drake diligently researching the truth about the man who said No. And back again; and so on, providing fresh cliffhangers as we switch from one chronology to the other. Needless to say, Wilkes’s treatment at the hands of his German inquisitors makes for some uncomfortable reading but eventually he escapes to fulfil a nerve-wracking role in the later stages of the war, a role in which Jarek’s fate is a significant driver of our central character’s motives. This is a tremendous read (I’m trying desperately to avoid the cliché rollercoaster) but the action bounds along on two fronts – the clever young intellectual whose researches take her from campus via Europe to a career in spookdom; and the sweaty excitement of one man’s war. Put David Tennant in the role and your film can’t miss. We move through war, cold war, politics, arms sales, love, heroism and skulduggery made all the more vivid by what must have been a colossal effort of research by the author. In this fast-paced thriller David Laws takes us deep into the dark heart of Nazi Europe as his prickly heroine, Emma, tries to uncover the truth about her grandfather – the man who said “No!”. Was he a hero or a traitor? What was behind his reckless bid to stop Prime Minister Chamberlain signing the infamous Munich pact with Hitler? Laws knows his history and he weaves it into a plot with strong imagery and enough twists and turns to keep the reader turning the pages well into the night. That makes for a more-than decent precis for a thriller – it’s not changing history to make a full what-if scenario, but adding a fictional character into a key, behind-closed-doors, global event. But what we have is a five hundred page novel, a real unapologetic airport shop door-stopper. OK, I’ll come out with it – the story of what really happened to the man is not the only story here. And what brings the rest slowly to light is actually a flaw for the book. Our heroine’s superior at Cambridge tasks her with constructing a conference on the Appeasement matter, which seems the least effective way to prove to the world a new discovery is of interest, seems to have a list of attendants nobody actually pieced together, allowing all and sundry to turn up, and which seems to be just a private yack-fest with incredibly fluid schedule, and nothing that would help Emma in her search. This whole aspect seemed utterly unrealistic to me, even if I bow to the author’s superior knowledge of such things. At the same time, the connection between Emma and her ‘helper’, however good his attributes, is still debatable, still a little guessable, and still a little too formulaic. I’m not saying there is a huge crop needed here, but I did think the pages, even given this edition’s fairly large font, were a tad too numerous. That said, they do provide for no end of shenanigans – the author really knows how to pack the action with twists, shifts in emphasis from one subject to another, and highly dramatic genre tropes. 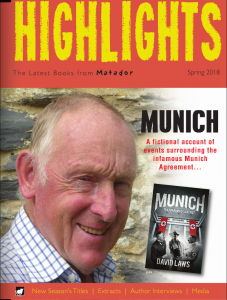 He seems to have researched Munich to death (and a glimpse at a future book suggests another German setting) – and in fact he conveys a lot here with authority. It’s not perfect – the papers that got dug up early on here seemed to lead to nowhere, and the characters ask at least one question that history doesn’t answer them, which stands out as a potential plot hole. Similarly, the author tries to deftly move from the POV of Emma to her assistant, and to a historical reportage, and while this is nearly there it doesn’t quite fully nail the voice each time. A couple of opinions suggest that Germany just never moves on, which is not fully true. But boy, if you want a book that can offer the usual thriller tropes – and still pull the wool over your eyes, and impress you with its moral heart – then you can get on board here with no problem.